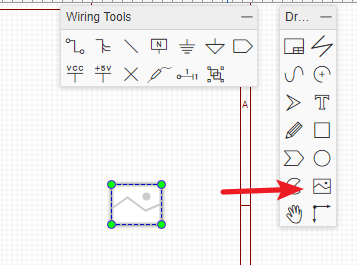 It is now possible to add design notes to the frame and the frame selection, for example A4, which can assist in aligning and improve the look of printed schematics and PCB designs. And you can edit the blue text when you’ve selected the text attributes or double clicked it. The bottom right zone can be selected and dragged or the frame can be dragged and deleted. With this tool, you can draw a pretty cool pattern. You can draw the arc of any shape. You can add arrow head to marking text or important part. Text: You can change text in inner box or double click the text. For every new text, the default text is Text. -Font-family: It provides 12 fonts for choosing. -Font-Style: It contains (auto), normal, italic. -Text type: types include comment and spice. The editor will remember your last text parameters. If you want to move some kind of parts and wires, you can use drag. Or you can select the parts and wires area first and move them. 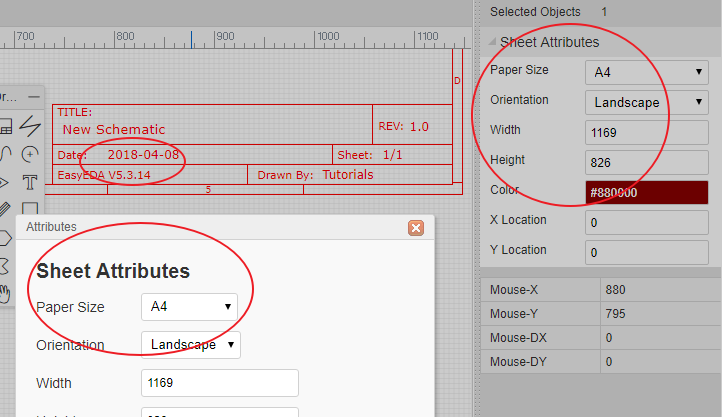 Canvas origin default is set at left top corner of the schematic sheet, but you can set it where you want via Canvas Origin. For another way to set canvas origin, you can try Topbar > Place > Canvas Origin.